Do you suffer from tension, tmj, or even migraine headaches? Do you clench or grind your teeth? Do you wake up with a sore teeth, neck or jaw? Do you wish there was something you could do to relieve your pain? If you answered yes to any of these questions, do we have great news for you! What is an NTI appliance? The NTI appliance is an FDA approved device, for the treatment of migraines headaches. It also works wonders to reduce the damaging effects of tooth clenching and grinding. Is the NTI a large, bulky appliance that fits over all of my teeth? Absolutely not!!! 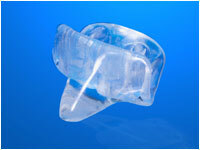 As a matter of fact the appliance, also called a night guard, is quite small and comfortable. It clips on to your front teeth and you wear it while you sleep. It has been proven to relax the muscles and can reduce the amount and severity of your headaches. A "mouth guard or night guard" that covers all of the teeth can actually allow you to clench HARDER than if you were not wearing one at all. How soon should I expect to see my symptoms subside? The relief of symptoms is directly related to the severity and longevity of each individual's condition. However, it is not unusual for some patients to report significant relief overnight; others usually within two to four weeks.